When it comes to grocery shopping I’ve always been and continue to be a perpetual skeptic when it comes to people trying to convince I need to buy certain “types” of anything. Unless there is a compelling reason why I need to buy a certain variety or food, I’m usually always motivated by price. This is something I learned from experience growing up in a family of six kids on a very limited income. But every once in awhile a certain food item will stand out for superior quality which elevates my eating experience so much, to splurge makes it completely worth it. This is the case with San Marzano tomatoes. 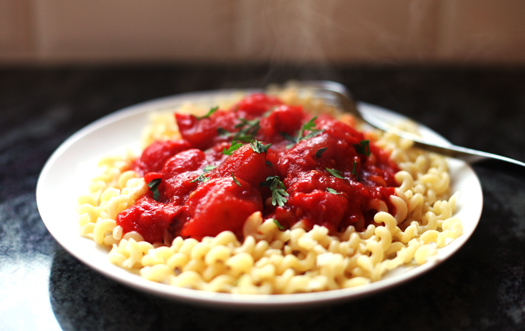 San Marzano tomatoes is a variety of tomatoes grown in volcanic soil in Italy. They are more sweet than acidic compared to Roma tomatoes and are far superior than any other type of tomato you can buy from a can. It was two years ago when I first started cooking with San Marzano tomatoes. Typically priced at least $1 more than the other canned tomatoes, I was convinced before ever taking one bite all the hype surrounding these tomatoes was just that.. hype. I don’t know why I believed this other than seeing one too many celebrity chefs on tv cook with this type of tomato – it had to be a marketing ploy. But it was reading about these tomatoes on Orangette and Smitten Kitchen which softened my cynical buying ways to convince me to give San Marzano tomatoes a try. Warning, once you go San Marzano you will never go back. 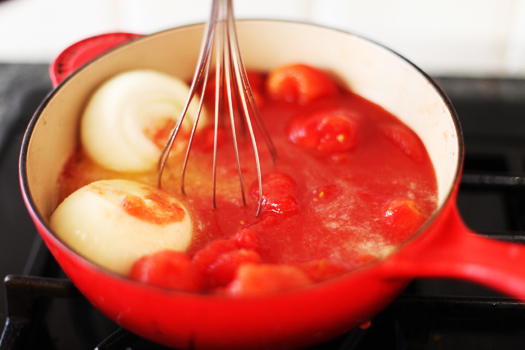 They are a life changer when it comes to cooking with tomatoes in the kitchen. I repeat… save your pennies because they are worth it. These tomatoes are magic. They actually make you look like a better cook than you really are. When used to make pizza, tomato soup, or a marinara sauce, San Marzano tomatoes makes me look so ridiculously good. I usually always have a can or two in my cupboard for when company comes over and I need a go to meal or when I do not have anything else to cook. 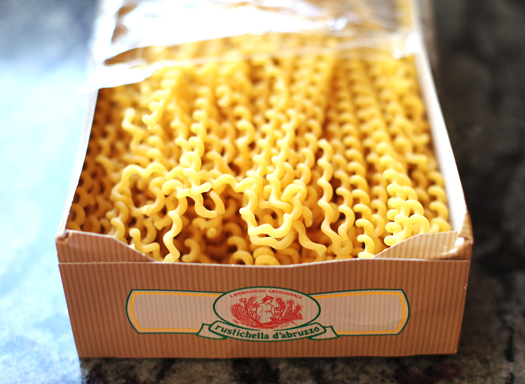 People who don’t even like spaghetti love when I make marinara sauce – especially kids. I’m also often asked for recipes when I used these tomatoes in dishes – I always give credit back to these types of tomatoes. You could say I am a San Marzano evangelist. Today I would like to share with you a basic San Marzano Marinara Sauce also known as Pomodoro slightly adapted from Marcella Hazan. This recipe will win you over – not because of anything I’ve created but all because of the San Marzano tomatoes. Enjoy! PS: Don’t even try to make this using anything other than San Marzano tomatoes – you will be disappointed with the results and doing so will rob you of the joy of eating one of my most favorite foods I’ve had the pleasure to eat. Update: Thanks to you all who have brought it to my attention that Marcella Hazan should be credited with this recipe. 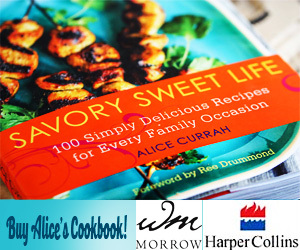 I originally discovered this recipe through Orangette and Smitten Kitchen as mentioned above. But yes, she should get credit where credit is due! Also, a few of you have brought up the fact that these particular tomatoes that I’ve used for this recipe are from the US and not Italy. All things set aside as far as orgin, I have made this recipe numerous times using Hunts and other types of tomatoes and it is not the same. Stricly based on flavor, the tomatoes in this particular green, white, and red branded can are better. I usually buy them on sale and a 28-ounce can goes for $2.99 on sale, normally $3.99 in Seattle. You live in Seattle? No wonder I love your cooking. I grew up there, but unfortunately life has taken me away from home! I will always be a Seattle loyalist, and you just can’t beat PNW cooking! I agree that these tomatoes don’t need the basil. I like to let these tomatoes shine through, and I was taught not to eat the onion in it also….I’ve been looking for this recipe, thank you! So I have a whole garden of San Marzano (probably 15 plants) and been making various sauces. Can you freeze this one? We also use a tomato mill to strip the skin and seeds out, so curious how you feel about this? 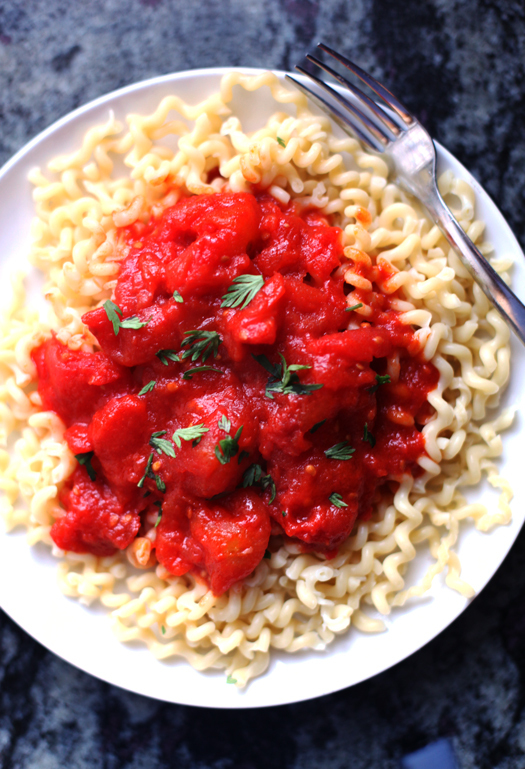 I have been using San Marzano tomatoes for a few years now. I must admit they are by far the best I have ever had. A little more expensive then other tomatoes but so much better its well worth the higher price. One thing I did want to mention though is this. I have read in a few places on the web that a San Marzano tomato is not a real San Marzano tomato if it doesn’t have D.O.P. on its label. I believe that stands for Protected Designation of Origin. English translation for Denominazione d”origine Protetta. Forgive me I may have killed the spelling on that. Anyway, Im wondering if there is really a difference in taste between the one that is labeled DOP and the one that is not. Has anyone tried them both and found a difference. Love to hear from anyone about this. By the way. I make my own pizza and I would never use another sauce on it. Everyone that eats my pizza loves it and wants to know my “secret” But I will never tell. So, you don’t eat the onion? I cannot imagine any marinara sauce without the onion finely minced and sweated first in a little olive oil. I’m a stickler I guess. I will have to see if I can track down this brand of tomatoes in north GA. And I would have to put in a little garlic. :o) Thank you! 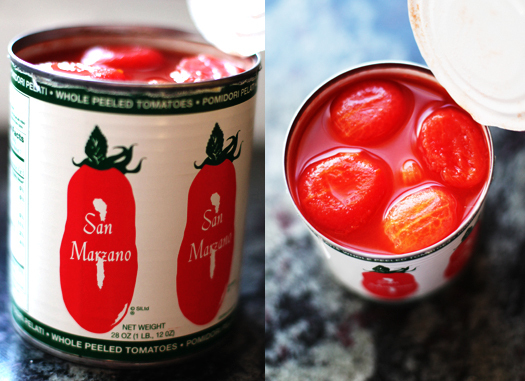 I recently purchased a few cans of the the San Marzano Cento brand tomatoes. I have to say they were not the same as the other kind. I was very sad. Really, no garlic or basil? … but you’re absolutely right about the deliciousness these tomatoes bring to the table ! This marinara recipe is easy and goo! And, it was a great starter recipe for my teenage boys. I’m having my 16 yo daughter make it tonight. I put 3/4 of the cooked sauce into the blender and it was perfect. This looks a lot like Deb’s post from 2010.